The 30-knot barrier is quickly broken on this kind of machine. The boat’s record is... 47 knots! In the car taking us to Lorient, there is a little tension in the pit of the stomach. You know, the tension you feel on a big day: a first date, a departure to cross the Atlantic, an interview for the job of your dreams... The mixture of excitement, impatience, as well as slight apprehension, faced with the importance of the event. A childhood dream. You are about to climb aboard one of the current biggest racing trimarans. 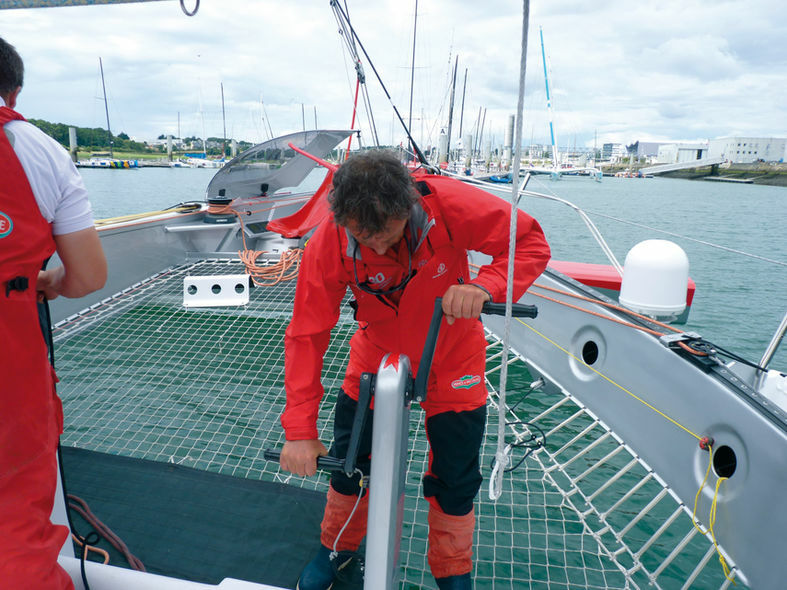 In the category qualified as ‘Ultime’, for the coming Route du Rhum. Eighty feet, singlehanded – do you fancy it? OK, you won’t really be alone aboard, and there is no question of closing your eyes for a single second, for fear of missing something, but you can dream, can’t you? So, you are there on the dock. Intimidated. Despite Lionel Lemonchois’s invitation to climb aboard as you please, you don’t move. Or rather, not immediately. You enjoy the moment. Your gaze starts at the bow, runs along the 24 meter length of the port hull in front of you and comes to rest at the transom. Sizing it up, estimating the scale, following the control line circuits, admiring each custom-made part, having your breath taken away by the long, sharp bows. Observing the team moving around, noting the areas where you can step, the bits of ‘string’ it is best to avoid. Go on, don’t worry, climb aboard. One foot on the huge square fender, then on the canvas protecting the silver-grey non-slip in the harbor. On the huge net, stretched tight as a bow-string, you leap-frog over the many lines crossing it. You step over the aft crossbeam to access the wide cockpit. There are no less than 46 control lines returning to it! I counted, but I’m afraid I might have forgotten some. Two coffee grinder columns, five winch drums which I’m not sure I could get my little arms round...that gives a first idea of the forces involved. Don’t get your fingers in the wrong place. There will be 7 of us aboard: Lionel, of course, Arnaud, who will spent a lot of his time adjusting the electronics from the monastic interior, Bambino, the flying number one, Gurloe, who looks after the 46 note piano (apart from the winch/coffee grinder synchronization lines, and the hooks), Vincent Marsaudon, the manufacturer of the new mast, and Jacques, from North Sails France, who has come to validate the final adjustments to the haute couture wardrobe which has just been delivered. We haven’t even left the dock, but Bambino is already harnessed and up the mast to fix the huge square headboard and its battens to the mast sliders. With the engine running and helped by two powerful semi-rigid tenders, we slalom tensely to get out of the base. Are you ready for a good cardio-respiratory session? “Hoist the mainsail!" Four of us set about the two coffee grinder columns. “Just think about breathing” Arnaud, my partner, whispers. I reassure him that I’m not thinking of anything else! And just a little of my arms, which, little by little are freezing up: first gear, second, overdrive...the winch strains, the men are exhausted. Sentence reduced, we are here to test the first reef. If the hook had worked first time, it would have saved us a bit of energy. However, we start again, twice. We send Bambino aloft to see what is happening, and ‘click’, that’s it, the mainsail is ‘hooked’. My exhausted look must touch Lionel, who laughingly whispered: “Singlehanded, we don’t hoist more than one reef at a time”...good luck, nevertheless!